The tumour microenvironment is a heterogeneous mixture of different cancer and cancer initiating cell types. Further cellular variability also arises from differences in genetic and epigenetic expression profiles, but also metabolic states (e.g., autophagy, dormancy, quiescence). These factors can all influence the effectiveness of therapeutic interventions and whether a tumour continues to progress, regress or becomes dormant, to recur later with the prospects of more aggressive phenotypes. Ascend’s belief is that rather than focusing on a precise oncogenic target or pathway, a more robust and durable response can arise if multiple independent pathways can be triggered to evoke cell death. 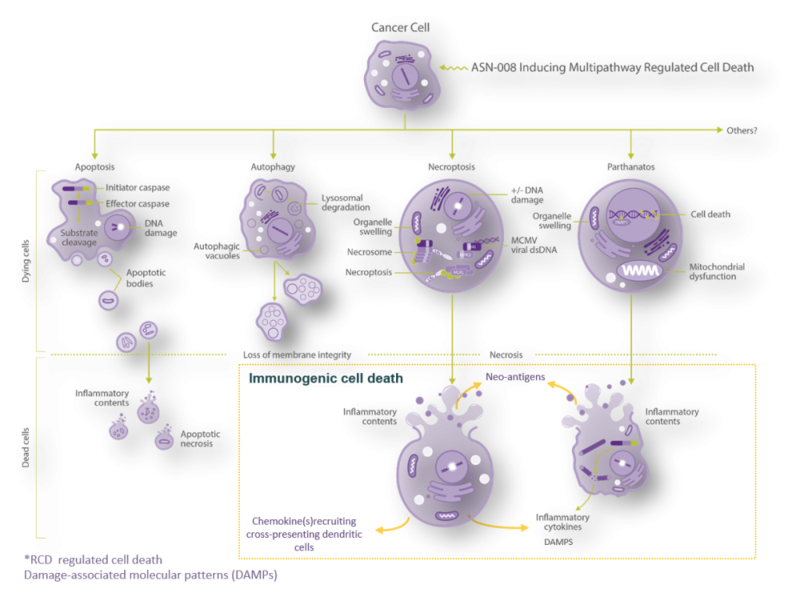 All cells within the body have multiple conserved pathways for inducing programmed cell death. These hard-wired programs for self-destruction are normally triggered by intrinsic and extrinsic stress or pathological cues. Ascend’s therapeutic strategy is based on developing treatments that are able to trigger multiple independent cell death programs, and on inducing highly immunogenic forms of cell death such as necroptosis. There is now clear evidence that how a cell dies can impact its immunogenicity. Ascend’s pipeline focuses on inducing forms of cell death that can drive a potent local anti-cancer response, but also induce systemic immunity to novel (neoantigens) and shared tumour antigens. Our pipeline applies a number of different therapeutic approaches including viral vectors, small molecules and biologicals. We believe that by applying a combination and chemo-immunotherapeutic approach, coupled with targeted delivery or administration, we can produce a more durable and effective clinical response.